When African violets are happy, they bloom for weeks at a time. The blooms and leaves will die, so remove them as soon as possible with a pair of scissors. 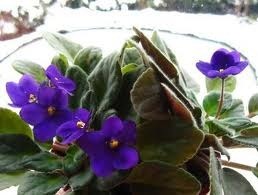 Water your violet every three weeks or when the soil feels dry. Add potting soil and plant food to flower pot, beginning and ending with potting soil. When the flower pot is half full of soil and plant food, gently remove the violet from the container it was purchased in and place it in the center of the ceramic flower pot. Finish filling the flower pot with soil and plant food. Add water slowly. Place the flower pot next to a window that faces west. Watch your violet bloom and grow.